End of Season Checklist for your Deck or Patio | 41 Lumber - Serving Iron Mountain and the U.P. It’s been a great summer and you’ve been enjoying your patio or deck as much as humanly possible, right? Well, remember early this spring when you opened up your deck and all of the work you put into it? By preparing your outdoor living area for the upcoming harsh weather, you could not only make your job easier in the spring, but you could prolong the life of your investment as well. Metal furniture usually consists of powder coated aluminum or painted wrought iron. For either, clean thoroughly and inspect for scratches or rust. If the aluminum paint is scratched, touch up with automotive paint. For wrought iron, wire brush any rust, and coat with an exterior spray paint that has been designed for wrought iron. For additional protection, follow with a coat of car wax on either types of material. Plastic furniture is easy to work with. Still, it should be cleaned to avoid staining. Wash with soapy water and be sure to store indoors, since plastic can become brittle in the freezing temperatures. Wood and other similar materials such as wicker should be inspected for damage, repaired and painted if needed. Teak requires an annual treatment with tung or linseed oil to preserve the natural color. If you prefer the natural weathered grey color that teak develops, treatment with oil in not necessary and the integrity of the wood will not be harmed. 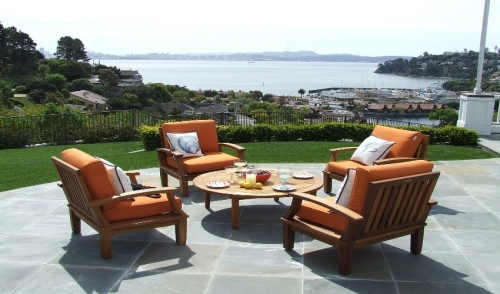 Fabrics for outdoor furniture are designed to resist mildew, though they are not immune. It’s a good idea to vacuum your furniture or shake off excess dirt before storing it for the winter. Soapy water should be used for tough stains, and if the fabric allows, a little added bleach will do the trick. If you’ve already refinished your deck this year, you should be okay. Regardless, it’s a good idea to wash off the summer grit and grime before the winter weather arrives. A power washer is great for this, just be careful not to damage the wood. As the fall season progresses, keep leaves and other organic debris off the surface as much as possible, to prevent staining over the winter. Some prefer to refinish their deck at the end of the season, to best protect it during the winter. To do so, thoroughly clean the surface with a formulated deck cleaner. Next, remove any remaining finish using a stain and finish remover designed for decking, and follow by sealing your deck with a water repellent finish. This way you will be able to stop the oncoming rain, sleet, snow and ice from penetrating your deck during the long winter. Winterize your grill by lighting it long enough to burn away any remaining food debris. Scrape the grill and empty the grease tray. Clean the outside surface with soap and water. Lastly, if you plan on storing the grill indoors, detach the propane take and store it in the garage or shed. If you don’t have room, you can cover it with a bag or plastic and store it outside. If you need to clean your hammock or umbrella, a hosing or light scrub with mild soap and water should do the trick. Be sure to let them air dry completely before folding up and storing indoors, to prevent mold and mildew growth. Trash bags are great for storing assorted cushions and pillows. Make sure they’re dry before putting them away! By all means, if you’re not ready to part with your outdoor living space just yet, enjoy it! With a patio heater and a couple quilts, there are plenty of wonderful fall evenings ahead to relax with friends and family.